MOSCOW, November 22. /TASS/. The dialogue between Russian President Vladimir Putin and his US counterpart Donald Trump has confirmed that there is a wide-ranging agenda in Russian-US relations, Russian senator Konstantin Kosachev wrote on Facebook on Wednesday. Putin and Trump held a phone conversation on November 21. The White House’s press service said the conversation lasted for more than an hour. The Kremlin’s press service noted that the dialogue was "business-like and substantial." The sides discussed Syria, Ukraine, North Korea, Afghanistan and Iran’s nuclear program. 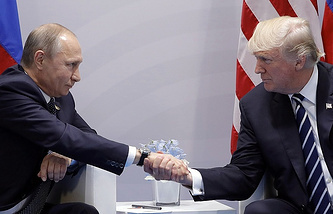 "The long-lasting and substantial conversation between Putin and Trump, according to mutual assessments, confirmed that a vast agenda remains in Russian-US relations, which may and should be discussed without preconditions and on an equal basis," said Kosachev, who chairs Russia’s Federation Council (upper house) International Affairs Committee. Kosachev noted that the Russian and US leaders discussed the issues, which are an important prerequisite for advancing bilateral relations. "I’m sure that if the US side [Congress and special services] had not put a spoke in the wheel of the dialogue between the two presidents, many agreements would have been not only clinched now, but also implemented," the senator wrote. However, over the past year most these opportunities have been tragically missed. "The responsibility rests with the US, not the Russian side," he stressed. "I want to believe that Washington will sooner or later realize this. I’m sure Moscow won’t be late in arriving," Kosachev wrote.